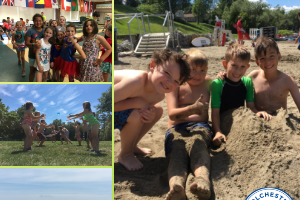 Renaissance Kid: Creativity and Curiosity Fuel a Young Artist | One to Watch | Kids VT - small people, big ideas! Connor Byam is a fast talker. Within a few minutes of speaking with him, a plausible theory emerges as to why this is the case: His mouth is simply trying to keep pace with his very active, creative and curious mind. The rising sixth grader is an avid reader — science fiction, fantasy and nonfiction are his preferred genres — who also listens to audio books and podcasts like Science Friday and Stuff You Missed in History Class. But it's his artistic talents that have garnered him recent attention. In June and July, the Davis Studio in South Burlington, where Connor has been taking art classes since he was a preschooler, hosted a show of his work. Technical drawings of imaginary vehicles with names like Pond Skipper and Storm Stalker hung across the room from a fake movie poster poking fun at fast food. In the latter piece, a sinister-looking donut, dripping with pink icing, appears under the fictional film title Desserts of the Devil! "I draw a surprising amount of evil food," he explained. The through line in Connor's diverse body of work — and what makes him such a great artist — is his "precision and patience," said studio director Teresa Davis, who's known Connor since he was 2. Davis Studio instructor Amanda DeCarlo has been giving Connor private, weekly drawing lessons since September. "I truly feel that Connor is an art prodigy," she said. "He is so far beyond his years in both wisdom and art skills." 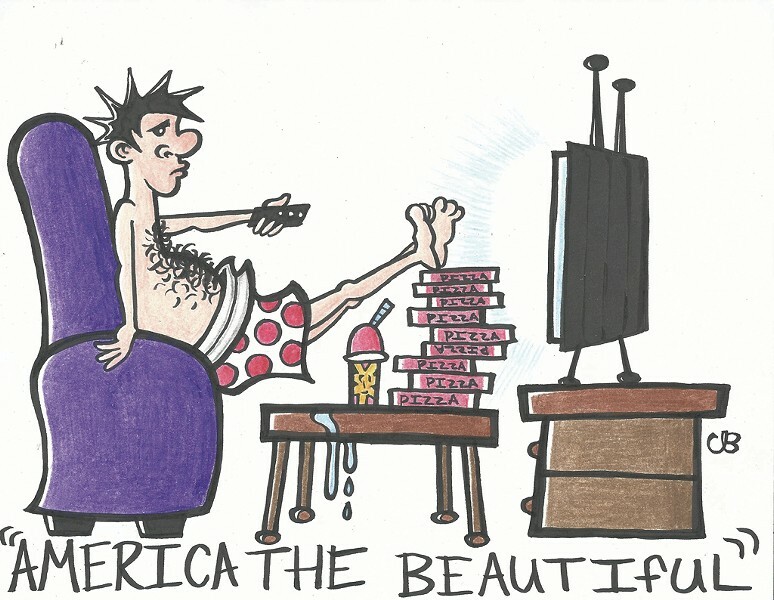 Those qualities are on display in another one of Connor's artistic endeavors — a one-panel cartoon called "Syrup & Cows," published weekly in The Winooski, a humor website that bills itself as "locally sourced organic Vermont satire." 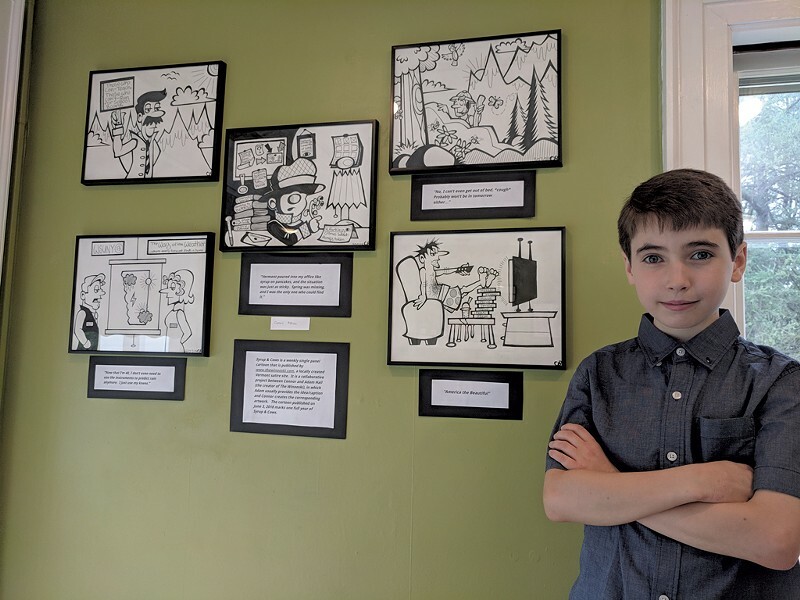 Connor started drawing the cartoon last June, after his Champlain Elementary School classmate, Ruby, recommended him to her dad, The Winooski's founder, Adam Hall. At first, Hall said, he was skeptical about a then-fourth grader contributing to his website. Then he checked out Connor's work on Instagram. "Wow, he's really good," Hall remembered thinking. The comic is a collaborative effort: Hall comes up with a caption and a general idea, and Connor brings it to life with pen and ink. Connor explained that he likes cartooning because "it can express viewpoints without making it dead serious." Realistic drawing, he said, "can get bland because you're doing something that's already there." 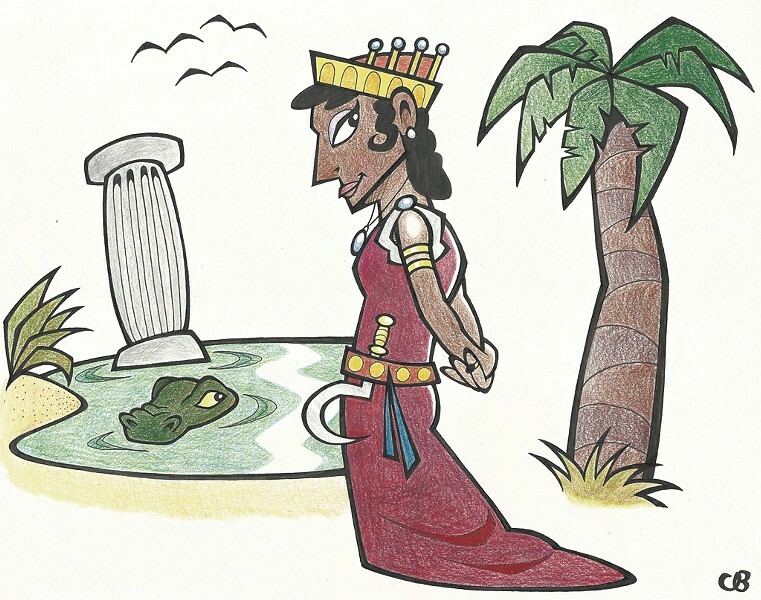 In addition to drawing the weekly cartoon, Connor is currently exploring his passion for history, working on a series of color drawings of notable historical figures, from Queen Zenobia, "a wealthy Syrian queen who took advantage of the Eastern Roman Empire's weakness," according to Connor, to Prince Shotoku of Japan, a Buddhist cultural reformer. Rather than simple caricatures, the works are peppered with details to show what each historical figure was like. In a drawing of Ivan the Terrible, for example, snow falling in the background symbolizes the Russian czar's "chilly, icy personality," Connor said. Though he's gone through a number of drawing phases, pirates and giant squids among them, Connor is currently into heads — "strange heads, normal heads, there are so many different features," he explained. When he looks at peoples' faces, "I start drawing them in my head as caricatures." Connor paraphrases the words of Leonardo da Vinci to explain the way he views the world: "Artists see things that others only catch a glimpse of." He cites retired cartoonist Bill Watterson, creator of the popular "Calvin and Hobbes" strip, as an inspiration. Watterson's cartoons are "really amazing," said Connor, but it's the artist's dedication to fighting for things he believes in — bigger panel space in newspapers and resisting licensing of his images because "he thought it was ruining the spirit of it to put it on things" — that really impresses Connor. One thing that doesn't captivate Connor's attention? Screens. He eschews computerized drawing in favor of Micron fine tip pens, Prismacolor colored pencils and Faber-Castell brush pens, which, he explained, make a "wobbly" line that lends illustrations a more "authentic" look. His dislike of screens extends to most television and movies, and video games as well. "Video games — they're like one second of fulfillment that really isn't fulfillment, so you never feel content with it," he explained. "But when you get done with a drawing, you feel like, Oh yeah!" See Connor's work at thewinooski.com and on Instagram at @bam_designs_vt.